Mexico is currently facing an unprecedented humanitarian crisis caused by the massive influx of migrants, mostly women and unaccompanied children, fleeing violence and poverty from the countries of the Northern Triangle of Central America (Salvador, Honduras and Guatemala). Mexico has traditionally been a haven for refugees and adopted an innovative and protective legislative framework. However, the Mexican government, concerned about security issues, and UNHCR Mexico, adopting a rigid approach of its mandate and a restrictive interpretation of the status of refugee, are reluctant or powerless to protect most of these migrants who face death, violence, xenophobia and discrimination and who don’t want to stay in Mexico. Over the course of the past century, Mexico has been a safe haven for individuals persecuted in their home country and seeking protection. In the beginning of the 20th century, asylum protection was granted on an individual basis. Leon Trotsky, the most famous, and other asylees (asilados) asked for political asylum: Republicans during the Spanish Civil War, Jews, Communists and other political opponents of the Nazi regime during the Second World War, American filmmakers and intellectuals persecuted during McCarthyism, Cuban exiles in 1959 and Chilean and Argentinian opponents of the military regimes between 1960 and 1980. These exiles, coming from intellectual and upper classes, generally settled in Mexico City and often returned back home after the fall of oppressive governments of their countries. In 1980, the Mexican government continued this long-lasting tradition of hospitality by choosing to grant “mass” protection to 46,000 Guatemalans, who were settled in refugee camps along the Mexican-Guatemalan border (in Chiapas, Quintana Roo and Campeche States). These Guatemalan refugees were given the opportunity to integrate locally with the help of Mexican authorities. Nowadays, many of them have been nationalized as Mexican citizens. However, this “mass protection” does no longer exist for the new migration waves from the Northern Triangle of Central America, considered as “migrants” rather than “refugees” by the Mexican government and by the inter-governmental agencies. The problem is related to the cause of the migration : these migrants flee general insecurity produced by violent non-state actors (VNSA) and the civil war, rather than direct threat or persecution from the government of their home country. Moreover, Central America is not considered a conflict zone according to the definition of International Humanitarian Law. Indeed, since 2009, the Northern Triangle of Central America is subject to various forms of violence, such as kidnappings, forced prostitution, torture, rapes, and murders perpetrated by violent non-state actors (VNSA): such as the « maras », and the drug cartels. In the years 1980-1990s, criminals originating from Central America set up, in Californian prisons, gangs called “maras” (Barrio 18 and Mara Salvatrucha-13 and others). After their expulsion from the U.S., the Maras took advantage of the weak governments and authorities in Honduras and El Salvador, destabilizing them and using their armed power to take control over cities. In rural regions, the violence is generally caused by the activities of drug trafficking organizations, such as the Mexican drug cartels that infiltrated Central America. According to the United Nation Report on Insecurity and Violence (Geneva declaration on Armed Violence and Development) El Salvador, Honduras and Guatemala have the highest rate of violent deaths, homicide by firearms and female homicide for the 2007-2012 period. As a consequence, more than 60 000 unaccompanied children crossed the border into Mexico between October 2013 and July 2014, many of them trying to avoid forced recruitment by the gangs. Single women are also vulnerable, frequently forced into marriages or relationships against their will, tortured, raped and forced into prostitution by gang violence. LGBTI individuals are the third main vulnerable group threatened by these gangs. They suffer harassment, assaults and murders. The suffering of the migrants from Central America continues after crossing the border into Mexico. They face new threats, once in Mexican territory, in areas controlled by Mexican drug cartels and maras infiltrated in Mexico. These migrants are also victims of the corruption of the Mexican police and personnel from the Mexican National Institute for Migration, as well as the xenophobia of local Mexican population. 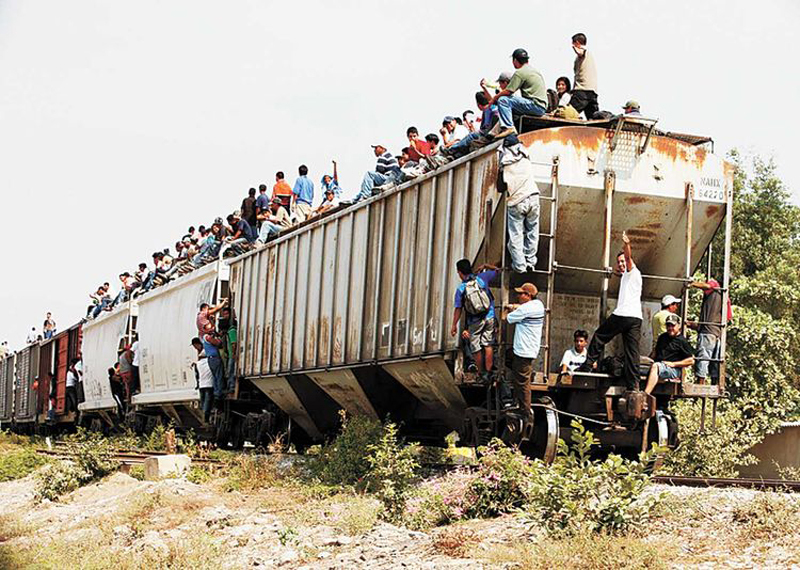 In 2011, Mexico passed the Law on Refugees and Complementary Protection offering broader protection to migrants. Firstly, it extended the status of refugees by explicitly adding the criteria of gender to the five orginal criteria of the 1951 definition. Secondly, the law introduced a form of complementary protection for asylum-seekers who do not meet the traditional criteria of the 1951 Convention but could not return to their countries due to other risks (torture or threats in their home country) . Finally, this law grants protection to migrants persecuted by non-State actors, extending the traditional criteria of the Geneva Convention requiring, as a condition for refugee status, a persecution by State actors only. However, out of 100 000 migrants fleeing the Northern Triangle of Central America in 2013, only 300 (approximately to 0,3 %) were granted refugees status and benefit from Mexican protection. Indeed, despite this wide and generous national legal framework, most of these vulnerable people are still considered as migrants by the Mexican authorities, but also by the UNHCR, and thus, are not entitled to legal protection. Why Mexico, traditionally regarded as an asylum sanctuary for refugees, became such a hostile land for these vulnerable migrants? Is there a moral and legal duty for Mexico to protect those migrants fleeing violence and its consequences in Central America? Maybe the traditional definition of refugee is outdated and should be reconsidered in the light of the current context of mixed migration flows. Note that this article was written in December 2014, while I was an intern at UNHCR Mexico. The same reasoning can be made for the current European migration crisis originated by the violent non-state actors (VNSA) and general insecurity in failed states.